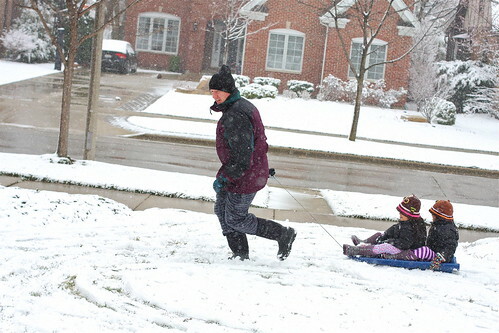 Sledding in pajamas in the front yard. Oh my , it was in the 70's here today. Glad they're making the most of the spring snow! So much for the sunshine and short sleeves a few days ago :(. Oh, how I remember the mercurial weather of Chicago! Brr! Hope it melts fast. I guess it turned more than rainy:( I am sure you are already missing the sun. Love how the girls and your husband are enjoying it anyway - I know I would be inside with a cup of cocoa!! Oh how I miss sledding! None of that happening here in Florida!